One of the more frequent questions we get from our potential customers has to do with how it compares with other similar looking softboxes with speedlights. Obviously, we have not tried every softbox out in the market. 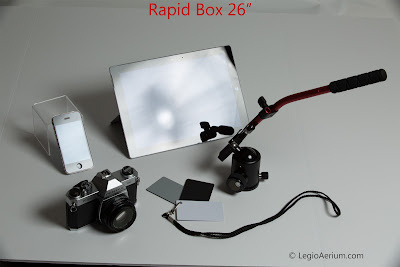 But I thought it would be interesting to compare one of the better known and well regarded softbox with SMDV's Speedbox: Westcott Rapid Box 26" and SMDV Speedbox-S65. * This comparison is focused on the light quality. Obviously, Speedbox is much faster to deploy and take down than Rapid Box. For instance, I can open up Speedbox-S65 in about 12 sec. What was surprising is how much more light loss there was with the Rapid Box. We knew that the SMDV Speedbox is more efficient. But the amount of the difference was a bit surprising. Here are the details on the set up and equipment used. Softboxes: SMDV Speedbox-S65 and Westcott Rapid Box 26"
We put a light stand at about 8 ft from a wall to place the softboxes. Another light stand was placed against the wall to make sure the light meter was at the same place every time. Room was dark ... very little ambient light. 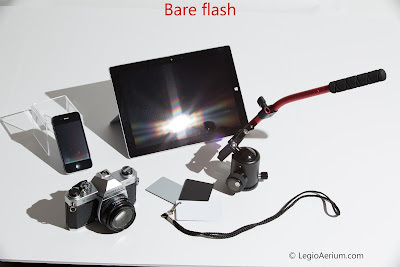 The flash zoom setting was set at 24mm because anything narrower is not going to be able to evenly fill the softbox. Below are some sample shots of a scene to show the difference. Here, the differences are readily visible. Here is one other observation. A lot of beginner photographers comment to us how SMDV Speedbox is expensive. SMDV Speedbox is not cheap. But we are convinced that it is a higher quality product. Light is softer and more even. Also, you get more out of your flash. For instance, some folks spend more to get bigger flash, but are not willing to spend more on softboxes to make the best of their more expensive flash. I feel that is being penny wise and pound foolish. For instance, if one gets Metz 64 to get more light (than Canon 430), you would get about 2/3 stop more light (see the chart below). But if you put Rapid Box (or some other cheap imitation of SMDV Speedbox), you would lose 1 stop of light. The person would've gotten more light (and better quality light) and saved more money by getting Canon 430 and using SMDV Speedbox. Here is what I mean. First, take a look at some relevant flash measurements. So, here are couple of options typically considered by beginner photographers. We understand that the difference between flashes models is easier to tell. But by failing to understand the differences in softbox quality, one who selects option #1 (or something similar) can end up paying substantially more for not only less light, but lesser quality light (option 1 is $263 more, but 2/3 stop less light). Finally, in some forums, some folks tried to dismiss us by saying that we are biased. It is true that we are biased because we are an authorized SMDV dealer. But, our findings are what it is. If anyone doubts it, we would invite you to test it and see for yourself. Finally, unlike many retailers, we actually use and believe in the quality of our products.